Jaisamand Lake : 48 kms from the city, this artificial lake was built in 17th century by Maharana Jai Singh. The marble 'Chhatris' along the embankment add grace to this second largest lake in Asia. On either sides of the lake were built the palaces for the favourite queens of the King. People of the Bhil tribe still inhabit the islands in Jaisamand lake. City Palace : City Palace, the majestic white royal building towers itself on a hill and is surrounded by crenellated walls. The palace was completed in its present form by the contribution of many rulers. Originally started by Udai Singh, the later additions were so carefully planned and integrated with the original building that it becomes difficult to believe that the building was not conceived as a whole. The city palace stands along the shores of Lake Pichola. 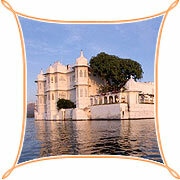 Lake Palace : The Lake Palace hotel amazes and delights you at every turn. Every inch of it is made of pure white marble, slender carved columns, fountains, filigreed screens and swimming pool, created for the private frolics of a princess. It is the early morning musical cacophony of birds and white masses of bougainvillea drooping over a rippling lily-pond that attracts the tourist. Erected atop Modi Magri is this equestrian bronze statue of the valiant hero, Maharana Pratap. Sajjan Garh, Gulab Bagh, Dudh Talai Park, the Sunset point are also the places to be seen. The Lake Palace Hotel is considered to be among the best hotels around the world. The Rajasthan Tourism Development Corporation provides various categories of rooms and dormitory at the Kajri Hotel. Apart from the hotels, there are Tourist guest houses and municipal guest houses. There are dharamshalas and the railway offers its retiring rooms at nominal rates. Paying guest accommodations are also available. Shopping can be a pleasure at the Hathipole, Chetak Circle, Clock Tower, Palace Road and Bapu Bazaar. Rajasthan Government also has its own Handicraft emporium. The shops of Udaipur have plenty of exquisite items to offer. The dainty folk toys, brightly coloured garments, hand printed textiles, batiks, and tie & dye sarees and fabrics to name few. 'Pichwais' or wall hangings painted on cloth are world renowned for their vivid colours and themes. The craftsmanship is at its peak in the metal images and chunky silver jewellery. Air : The City of Lakes is well connected by air services. The Dabok Airport is 21 kms from the city centre. Rail : Railway has trains from all over the country to destination Udaipur. 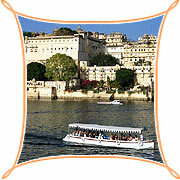 The Palace On Wheels covers this magnificent city during its eight day package tour. Road : There are bus services from tourist places in Rajasthan , Gujarat and Delhi.